Introduction: Established in 1994 by the Southeastern Electron Microscopy Society, (now The Southeastern Microscopy Society (SEMS)) as a tribute to the memory of one of the Society’s most beloved and distinguished members, Dr. Jerome J. Paulin, the fund enables eminent scholars from SEMS to visit and deliver lectures on current topics in microscopy to regional institutions. 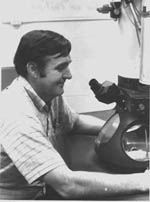 Jerry Paulin believed very strongly in the need to educate the youth of America, and he held a special appreciation for the field of electron microscopy and the importance it continues to play in research. Each year two to three SEMS members would volunteer to travel to academic institutions throughout the southeastern United States and present seminars that deal with some aspect of microscopy and how it impacts on today’s science. Any private or public institution of higher learning may apply to the Directors of the fund and request funds to cover the costs associated with having a SEMS speaker visit their institution. Concept: As Jerome J. Paulin was a firm believer in the need to provide students with a better idea of the value of microscopy, it would seem likely that he would approve of a fund that would allow SEMS scientists to travel throughout the southeastern United States to “spread the word” to institutions and students who might not otherwise be able to afford the cost of hosting such speakers. Each year two to three prominent SEMS members will be asked by the Directors of the fund to volunteer their services in support of this effort. While an honorarium may be offered by the sponsoring institution it is understood by the SEMS lecturers that funds for such an honorarium are not to come from the Memorial fund and that the volunteering of their time is to be viewed as a contribution to SEMS and to the memory of Jerry Paulin. Participation will allow one to not only spread the word of microscopy but also to improve the profile of SEMS as a society. Funding: The fund is to be established by a one time “seed” grant of $1000 from the general treasury of SEMS with additional funds coming from private donations. The investment of these funds is to be carried out by the SEMS investment director and these funds are to be clearly earmarked and kept separate from other SEMS accounts. Each year the interest monies generated by the fund will be used to pay for the costs associated with the visiting lectureships. Expenses such as meals, housing and travel are deemed to be appropriate but are subject to approval by the Directors of the fund. Administration: The fund is to be administered by at least three members of SEMS, at least one of which is to be a member of the SEMS Executive Council. A Director of the fund (whose tenure may he renewed on an annual basis) will be appointed by the President of SEMS. Sponsoring institutions will apply to the Directors of the fund for the monies to bring in one of that year’s designated speakers. A detailed estimate of the costs will be provided at the time of the application. Following approval of the application the Director will contact that year’s volunteer lecturers and attempt to arrange for one of them to visit with the sponsoring institution. If a suitable scheduling cannot be arranged the Directors are to notify the sponsoring institution immediately. Announcements of the Visiting Lectureships are to be made through regular SEMS publications and by other means. A mailing of announcements of the fund may be made to the appropriate academic officials of institutions throughout the southeast. The cost of these mailings are to be borne by monies from the fund and not from the general SEMS treasury.